Be sure to alert your employees, patrons and visitors to situations or areas that require a little extra attention. Avoid accidents and keep your facility and grounds safe! 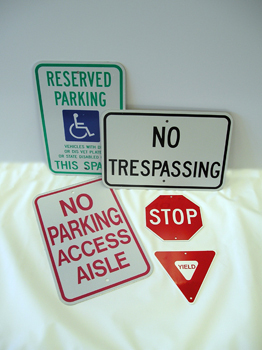 Standard parking and traffic signs, machinery signs construction and warehouse signs, security signs, fire and exit signs, industrial and front office signs - all are available. Talk to one of our representatives. Our experts can also assist you with Occupational Safety and Health Administration (OSHA) required signage for your facility.